Grape salad recipe with three beans - the perfect cooling summer salad. Grape salads are almost as popular as bean salads in the summer for a light and cooling lunch or side for a summer barbecue, picnic or potluck. This vegetarian (and almost vegan, if you use agave nectar instead of honey and regular mustard, instead of honey mustard!) 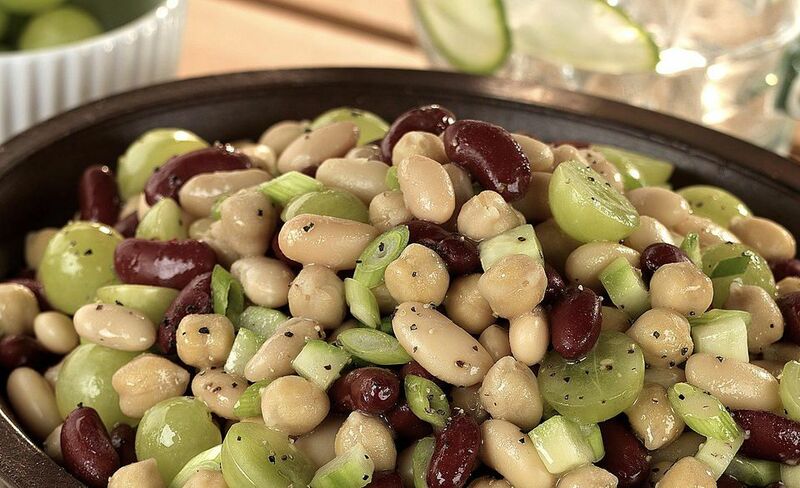 three bean and grape salad is made with garbanzo beans, kidney beans, white beans, cucumber and grapes. It's also gluten-free as well. To kick it up a notch, use a gourmet flavored oil in place of regular canola, perhaps something light and a touch fruity, avocado or sunflower oil, and we always recommend cooking with sea salt or kosher salt for the best flavor. First, prepare a dressing by whisking together the red wine vinegar, honey, and honey mustard until well combined in a large bowl. Slowly whisk in the canola oil until the dressing is well emulsified. Next, gently stir in the green onions, beans, diced cucumber, and grapes, lightly tossing together until well coated with the dressing. Finally, place your salad in the refrigerator until well chilled. This summery bean and grape salad is best served chilled. For presentation, you could place it atop a plate of romaine or butter lettuce leaves. Makes ten servings as a side dish, but if you were serving it at a luncheon as more of a main, then count on it serving around six.